Despite our almost daily visits to the shoreline here in Broome I have suddenly realised that my recent posts have all been focusing on inland areas! Of course there has been a good reason for this, especially when we discovered the first Temminck’s Stint to ever be observed in Australia! We also did some inland birding to the Pilbara in November, but I will return to some news on the shorebirds along our coast for this week. This is mainly due to the fact that we found a rather special bird recently on Cable Beach in Broome. On 11th December we walked over the dunes to Cable Beach to observe the high tide roost and generally there is a nice flock of Greater Sand Plovers, Red-necked Stint, Red-capped Plovers and the occasional Lesser Sand Plover, Red Knot, Great Knot, Curlew Sandpiper, Grey-tailed Tattler and Terek Sandpiper on larger tides. 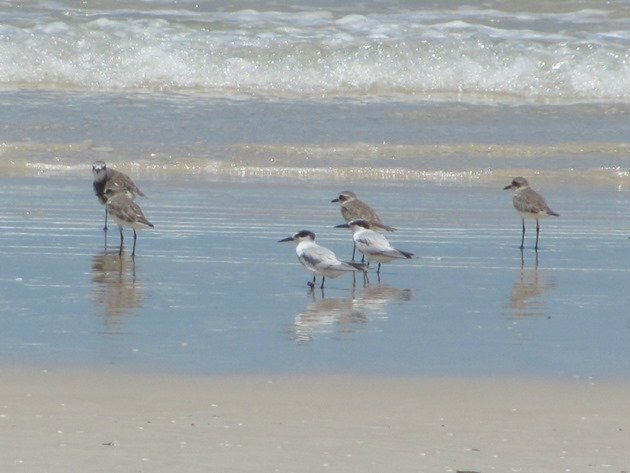 The flock can throw the odd surprise like an Asian Dowitcher, but this time it was the large number of Terns among the flock that grabbed our attention. There were Common Terns, Little Terns, Whiskered Terns, Crested Terns and Lesser Crested Terns present, but the first Little Tern we observed had a small white flag on its left tarsus. It was stood in shallow water and soft sand and we soon established a blue flag below the white flag. As the waves washed around its feet we could see the flag was engraved, which would mean that the individual bird would be able to be identified. The Terns in these flocks can often be the first birds to lift off if they feel threatened in anyway, so patience was required as the tide slowly dropped and the Little Tern remained in the same area. In fact it was only minutes when the engraved blue leg flag became visible and we could read it. The engraved blue leg flag read “M1” and there was also a metal band around the right tarsus, but it is no longer necessary to get that information with the presence of engraved leg flags. This indicated that the Little Tern had been captured in Taiwan. In days gone by there was no hope of reading a metal band in the field unless you captured the bird, but nowadays there are cameras that can pick up the writing on these small metal bands. The problem with that scenario is the metal band wraps around the birds leg, so you need to photograph all sides of the metal band! There are people out there that do manage it and information can be gained from the reading! We are familiar with the variety of coloured flags and engraved leg flags used along the East Asian-Australasian Flyway and it is not uncommon for us to observe migratory shorebirds marked in China, who use black flags and white flags with engraved writing on. It is a lot less common to observe shorebirds from other areas in the flyway, but as the shorebirds return from the north we do observe shorebirds marked in Victoria and South Australia when they drop by to rest before crossing Australia to their original banding site. We have also observed shorebirds marked in Japan, including a Red-necked Stint marked in Japan last year. We have observed an individually marked Grey-tailed Tattler from Taiwan each year in the non-breeding part of their year since late 2012 and it is especially nice to see its safe return to Broome each year. We have also observed a Red Knot that was given flags in Thailand recently along Broome’s beaches, but with plain flags they do not know the individual bird. The variety of flags is complex and it is also worth noting that in some countries the flags are used on either the left or right hand side of the bird to establish the exact banding location and some of the flags may have clipped edges. 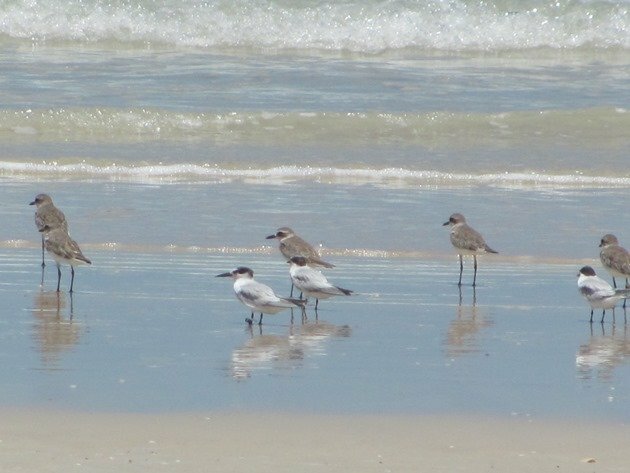 You can never get too much information on an individually marked shorebird! We always attempt photographic evidence, which often does not show the engraved leg flag writing very clearly but is enough evidence of the bird’s presence in Australia! With modern technology we were able to establish within hours of our observation when the Little Tern had received its flags and metal band. On 27th June 2015 it was captured by the Wild Bird Society of I-Lan and once you open that link you may want to translate it! It was captured at Lian-Yung Estuary, I-lian County, Taiwan and was subsequently observed on 24th August 2015 at Xiaying, Tainan City, Taiwan. The next observation was right here in Broome on 11th December 2015! The history of this wandering Little Tern is available online here. It is possible to check on the Shorebird Resighting Information of East Asian-Australasian Flyway website for other individually marked Little Terns from Taiwan that have been observed overseas. 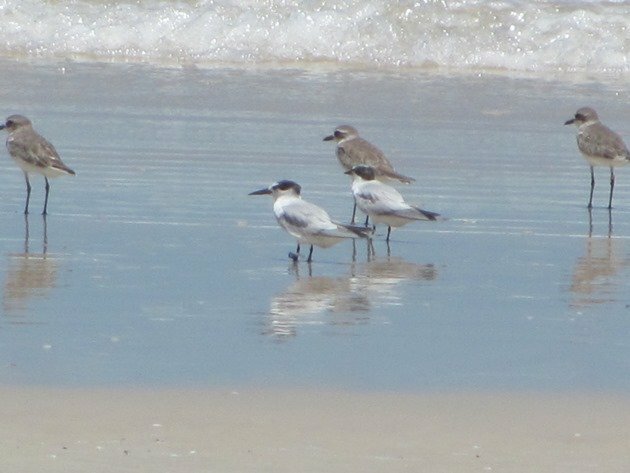 There has only been one observation in the past and that was in 2012 several hundred kilometres south of Broome on Eighty Mile Beach and the individual Little Tern has not been seen since according to the website. 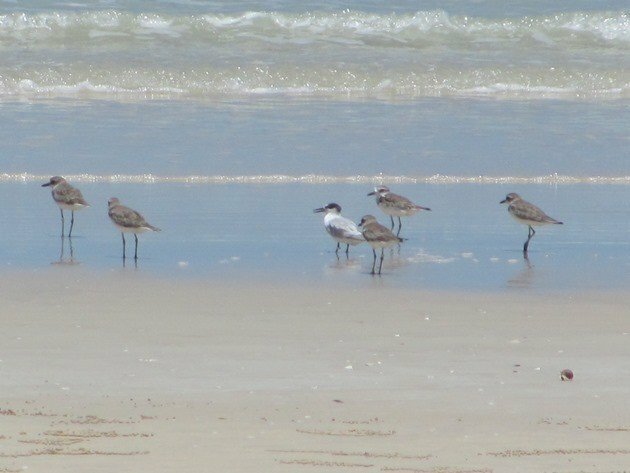 It is known that there are three populations of Little Terns in Australia and includes the resident breeding population across the north of Australia that we have observed breeding at the Northern end of Cable Beach. There is a second population that breeds on the coast of eastern and south-eastern Australia and then a third population that breeds in Asia and visits Australia during our summer months in its non-breeding season. The Little Tern “M1” from Taiwan is obviously here for its non-breeding season this year and we hope it gets observed along the flyway in future years. Wherever you travel to for your Christmas holiday we wish you all the best and may some interesting birds cross your path! Where are you birding this weekend? – Prove it!